I was five years old when I first knew who Stan Lee was. In 1981, I would religiously wake up before my parents did on Saturday mornings to watch Spider-Man and His Amazing Friends. Stan Lee would voice a preface for each upcoming episode, and I remember knowing that the sound of his voice would mean a quality show was to come. It was doubly so when they would later add the Incredible Hulk to make it a full hour of Marvel characters. The cartoon would lead me to read Marvel comics (as I imagine the cartoons were intended to do: be a marketing venue for the comics). Within most printed Marvel comics there would be on the opening splash page: “Stan Lee presents:” as well as “Stan’s Soapbox” which was his editorial that would be promoting a new series. Stan Lee is of course indelibly tied to Marvel comics. As I grew into my teens, I never much thought of Lee besides that of an old hokey self-promoter. His comics weren’t edgy enough compared to much of the mainstream comics during the late ‘80s and early ‘90s (he tried an awful endeavor to reimagine DC characters with a darker slant). However, as I started to become a comic creator myself in my early twenties, I began to read and hear stories of Stan Lee that almost every serious cartoonist knows: Stan Lee fucked over a lot of people. Most people on the street know Stan Lee’s name, but most are also almost entirely unaware of the other comic industry giants that made all of Marvel’s characters possible. People like: Jack Kirby, Steve Ditko, Bill Everett, and Joe Simon contributed as much if not more to many of the beloved and iconic characters we know so well today. 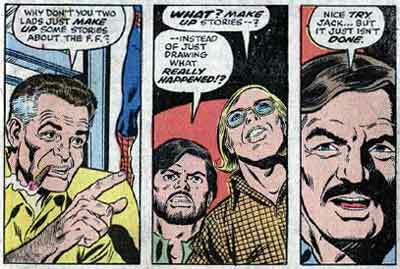 Stan Lee usually created narratives in interviews implying he was the sole creator of such characters as Spider-Man, Fantastic Four, or Black Panther while the truth was much more complicated. Stan Lee taking full credit for most of the Marvel characters had deep repercussions for many of his co-creators and their families. While the Marvel business empire grew with merchandise and tie-ins which are still ubiquitous today, many, if not all of the co-creators did/do not see a dime for their creations and have their artwork plastered across t-shirts, lunch-boxes, and toy packaging. Even recently, many of the Jack Kirby’s creations go uncredited to him while they fill the movie screens across the world raking in billions. There is sort of a poetic justice that happened with Stan in the late ‘90s, he had departed from Marvel to create his own company that within a few years went bankrupt and he, like many of the co-creators he screwed over, had to sue Marvel to receive royalties from his characters in film. Similar to Steve Jobs who is the face and name of Apple Computers, while only the ardent talk about Steve Wozniak, so too is it the way of Stan Lee. My twelve-year son and many of his friends are sad at the passing of Lee and see him as the funny guy who does cameos in the films they really enjoy and is the creator of all of the Marvel comics. Would Marvel be where it is today if not for Lee’s constant promotion? Undoubtedly not. The hard truth is that the Marvel comics we see today whether on the page or on screen would not exist without Stan Lee. He just didn’t do it alone. Lonnie MF Allen has long been a stalwart of Denver’s comix scene. He’s an illustrator, writer, and designer. 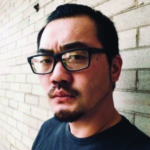 Lonnie is also the cat-wrangler of Denver Drink & Draw and was named as one of Westword’s “100 Colorado Creatives.” His work has been published by Dark Horse, Image Comics, and he’s a regular contributor to the Colorado Sun.